Deep Learning Price Action Lab™ (DLPAL) is based on a proprietary deep learning algorithm that produces the same output each time it encounters the same market conditions. This determinism and the absence of stochasticity are in compliance with the standards of scientific testing and analysis1. DLPAL minimizes data-mining and data-snooping bias through the use of a proprietary unsupervised learning method for feature extraction and selection. Several functions are available for validation of the results including a randomization tool for ranking the performance of strategies2. DLPAL software solutions have evolved from the first application developed 18 years ago for automatically identifying strategies in historical data that fulfill user-defined risk and reward parameters and also generating code for a variety of backtesting platforms. DLPAL S identifies parameter-less strategies in historical price data that fulfill user-defined performance statistics and risk/reward parameters. The program generates code for strategies and systems for popular platforms. Several validation methods are available for testing the significance of the results. DLPAL DQ is an end-of-day scanner for discretionary quantitative traders. The software scans any number of securities for price action anomalies. Validation tools are included and code is generated for a variety of platforms for further testing. DLPAL LS is unique software that calculates features measuring the directional bias of securities and also generates historical values of those features. The software is used by by professional traders and hedge funds for the development of directional and long/short trading strategies based on fixed algos or machine learning using generated train and score files. The results of this software cannot be replicated easily by competition. DLPAL S identifies parameter-less strategies in historical price data that fulfill user-defined performance statistics and risk/reward parameters. These strategies are also known as price patterns. The program uses primitive attributes of price action, and specifically the open, high, low and close, to extract features types in an unsupervised learning mode based on general feature clusters3. Then, the program uses the extracted features in supervised learning mode to identify strategies and systems of strategies that fulfill the user objectives. DLPAL S generates code for strategies and systems for the Quantopian platform, Tradestation (EasyLanguage), Multicharts (EasyLanguage), NinjaTrader 7 and Amibroker AFL. Several validation methods are available for testing the significance of the results. In the daily timeframe, the system tracking module of the program can be used to monitor signal generation of the strategies and systems going forward in time and as new data are available. Click here for a free demo trial4. For articles about DLPAL S click here. DLPAL DQ has most of the functionality of DLPAL S but for the purposes of an EOD scanner. The program identifies parameter-less strategies in historical price data that fulfill user-defined performance statistics and risk/reward parameters as of the last bar in the input data files. These strategies are also known as price patterns. DLPAL DQ generates code for strategies and systems for the Quantopian platform, Tradestation (EasyLanguage), Multicharts (EasyLanguage), NinjaTrader 7 and Amibroker AFL. It also offers two validation methods. For examples of signals click here. 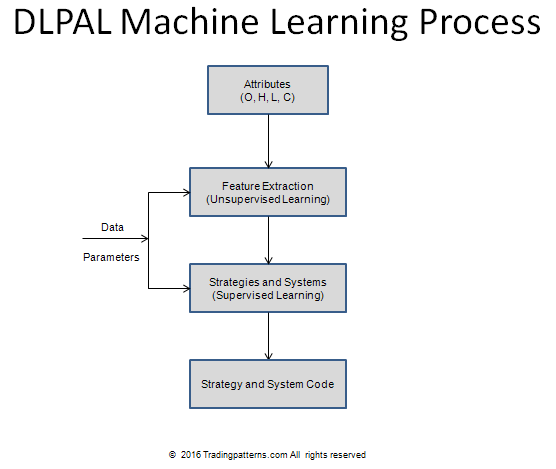 DLPAL LS uses primitive attributes of price action to extract features types in an unsupervised learning mode based on general feature clusters. Then, the program uses the extracted features in supervised learning mode to identify long and short candidates in a universe of securities. The long/short identification is based on a set of calculated features and the user has flexibility in ranking the results according to their values. The output of the program can be saved in csv format and can be used in conjunction with trading platforms to automatically execute trades. For more details click here. 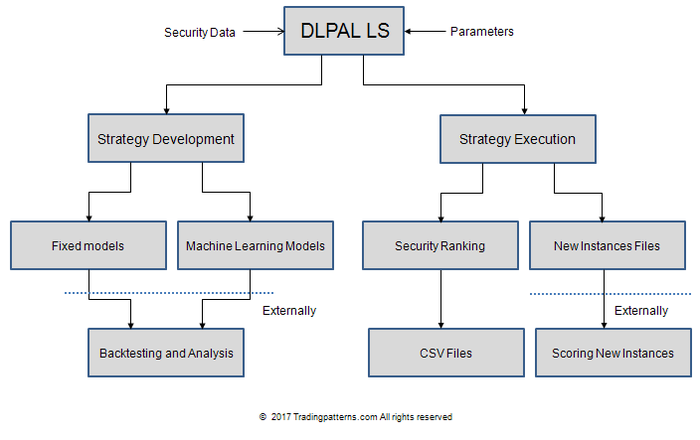 DLPAL LS is used to develop algorithmic and machine learning strategies for directional and long/short trading5. Users of the program can sort results based on different criteria and generate output for trading APIs. Historical files of features can be generated for backtesting the strategies and for machine learning. Click here for an example and here for more details and for information on requesting a free trial. Click here to order demo trials. After you install the trial versions, an online demo can be arranged. Contact us for more details and requirements. 1. If a data-mining method exhibits stochasticity by generating different results each time it runs with same data and parameters then it cannot be cross-validated. 2. Monte Carlo simulation is not available because it is not an appropriate method when trading strategies are determined from the data and for this reason it can generate misleading results. 3. DLPAL does not use pre-programmed strategies as it is the case with some other commercial programs that work based on a database of patterns they apply on each case. DLPAL identifies patterns in price action. 4. DLPAL S and DLPAL DQ free demo trials have certain limitations. Click here for more details. 5. DLPAL LS is available only to hedge funds and professional traders.